Soon after replacing our decades-old 13-inch Sony TV with a 47-inch HDTV in December 2014 (yes, we used it for that long! ), I started looking into HDTV antennas. 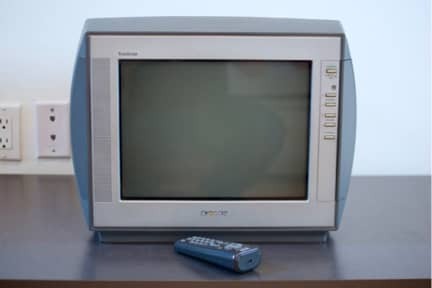 I quickly discovered that there’s actually nothing special about HDTV antennas and that the old rabbit ears we all used in the analog days would work perfectly fine. I happened to have a pair sitting in a box in the basement which supplied me with about five or so channels depending on how I’d hold it. I tried a bunch of different experiments from putting the antenna up high, moving it to the front or back of the house, connecting it to a ground, even using coat hangers in place of the antenna. Some attempts improved the reception of the channels substantially while different placements would yield different channels. At the very least, my tests helped me to see that there are actually a lot of over-the-air HD channels available where I live. And that’s when I started looking at antennas online. You can buy some pretty inexpensive ones, but as expected they have very mixed reviews. And then on the other end of the spectrum, I don’t watch enough TV to justify spending hundreds of dollars on more extreme antennas, so that’s when the idea of making one from scratch entered my mind. Turns out, you can find an abundance of resources online with instructions on how to build your own antenna. My research brought me to the Gray-Hoverman antenna and ultimately, the website DIYtvAntennas.com with a Single-Bay Gray-Hoverman antenna that looked easy and cheap to build. A good first-attempt antenna I thought. The antenna is supposed to be installed in an attic but I don’t have access to the attic and I didn’t want to get up on the roof either. My solution was to buy a weatherproof balun and to coat the wood in a waterproof finish that they use on boats. The antenna sat in the middle of the backyard propped up with snow for the course of the winter, until the spring when I finally mustered up the courage to attach it to the house on a flimsy ladder with a painfully swollen wrist. I also built a large reflector to put behind the antenna per the instructions on the site, but I removed it because it was way too heavy for me to install at that height and I was getting better reception without it anyways. For less than $10 in hardware, I now get 25 channels in crystal-clear HD quality. 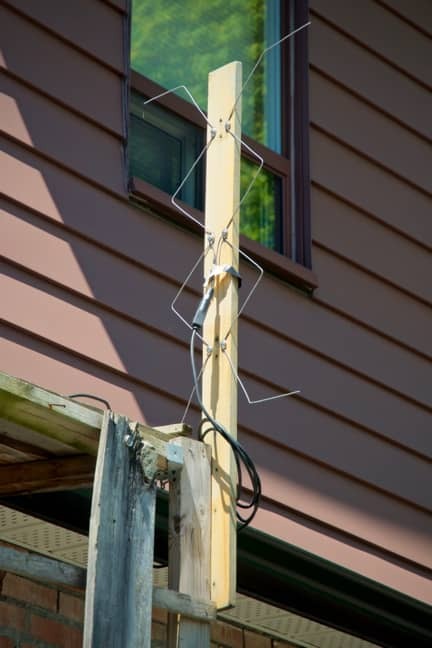 If you have screws, wire and scrap wood lying around, you could make this antenna for next to nothing. Following the instructions is important though — you want to get all the measurements and angles as precise as you can. The most expensive part was actually the super-long coaxial cable that I needed to run from our living room, down through the basement and then out the back of the house. Inevitably, when people see this antenna from our backyard they ask how good it is and are always shocked to learn that it picks up 25 channels in HD. Just wood and wire. Like all antennas, it’s still subject to cloudy days and bad weather but the reception is phenomenal otherwise. Homemade HDTV Antenna was published by Daniel Menjívar on April 30, 2016 at 12:00:04 PM EDT and last updated on April 18, 2019 at 4:41:11 PM UTC .